There’s a certain type of nerd out there in the real world that can’t help but coil in disgust at the mere mention of Brett Ratner. Unforgiven is he, and so shall he remain, for the legacy he left the X-Men movie franchise in following his effort with The Last Stand. He will never get over the reputation held by many as “that guy who ruined Bryan Singer’s franchise”. Not me personally. Growing up on a diet of kung-fu films, I still see him mainly as that guy who made Rush Hour, one of the better western Jackie Chan movies. Also, whisper it quietly, but I don’t think X-Men: The Last Stand is the worst thing to come out of the comic-book adaptation revival of the 2000’s; or even the X-Men franchise for that matter. In fact, it has some pretty great action sequences made in an old school “high wires and real explosives” kind of way, as opposed to being totally CGI. 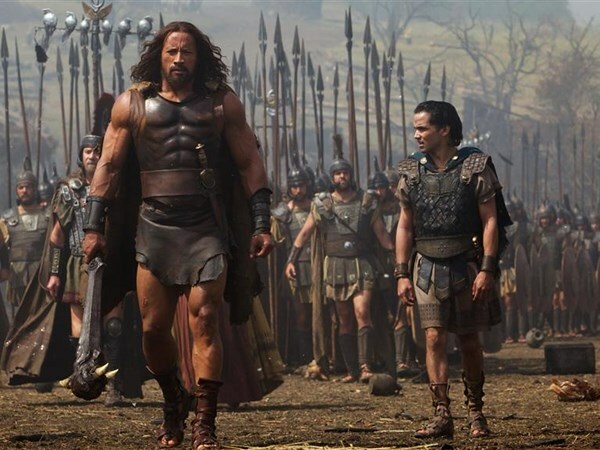 It’s the way he captures these impressive action scenes that, once again, is what he most successfully achieves with his latest flick, Hercules. For anybody who has seen the trailer, a word of warning should probably go out that it is incredibly misleading. Forget it. Pretend that you’ve never seen it. Do you still have burnt into your mind the lingering memory of the woeful, tedious and entirely disappointing Clash of the Titans remake, therefore are expecting yet another snooze-inducing, monster-bashing, mythological sword and sandals affair? I am happy to be the one to inform you that this is far from it. This is hardly a remake of the Disney animated classic. Dispensing with the monsters and mythical beasts within the first 5 minutes during a dramatic and exaggerated narration sequence, the movie we are presented with instead revolves around an older, more world-weary, mercenary-for-hire Hercules character. Together with his band of brothers (and one sister) he enters into one final contract to earn that last bag of gold. Just one more pay packet, enough for him to retire on and live out his days in solitude, away from the pressures that being a celebrity in ancient Greece holds. Wouldn’t you know it, not quite all the facts of this contract have been revealed to our scantily clad hero and his merry chums. The ensemble cast (including a performance from the gargantuan Dwayne Johnson as the titular protagonist that is somewhat less charismatic than we have become accustomed to) does at least have an element of genuinely believable camaraderie between them. Ian McShane raises more eyebrows than our lead actor with his performance as the profit who sees only what the frequently annoying God’s want him to see, which as legend goes even includes his own death. A Spartan and best friend of Hercules, played by Rufus Sewell, provides us with most of the banter within the group and often at the expense of the invaluable storyteller (Reece Ritchie). I say invaluable, I mean he often provides exposition and insight into the groups history. The Norwegian actress Ingrid Bolsø Berdal, playing a skilled archer, and a mute crazy warrior scarred by his past (also played by a Norweigan, Aksel Hennie) make up the remaining members. They appear to riff off each other well enough, albeit in a rather scripted way. Together, they help Lord Cotys (John Hurt) reclaim the land that once belonged to him. With a plot not as straightforward as may have been apparent, the twists and turns along the path are delivered at an unwavering and consistent pace. It could have been stupid. Actually, it probably is a bit daft. But nevertheless, it all comes together evenly and most importantly, it’s actually entertaining in that popcorn munching, Coke slurping way you’d hope for. It also has a touch of the Spartacus about it. There’s clearly a socialist (or, at least, democratic) message buried underneath the mounds of baby oil and loin cloths. To say any more may be to spoil some of the second half of the film, but it definitely tries to have some deeper meaning tucked away in there. Back on the podcast earlier this year when reviewing Pompeii, I accused Paul WS Anderson of being a director who “doesn’t make films badly, he just makes bad films”. Similar in some respects as these two films may be, it would be unfair of me to level that same accusation at Ratner’s version of Hercules. It’s not a bad movie at all. The story may be a tad lightweight, relying on some montage sequences and an audience either too young or wilfully ignorant enough to overlook some rather polarised set pieces. However, like Pompeii, it is also surprisingly watchable. Teenage boys who aren’t quite old enough to watch the superior 15-rated 300, or of the wrong generation to have seen 1982’s Conan the Barbarian, seem to be this 12A’s target audience. Which is fine. They will most certainly be the people who get the most out of it. It’s not a film to challenge your preconceptions of anyone or anything, but it will provide a couple of cheap thrills and who knows, maybe it will even help to ease the monkey off of Ratner’s back a little. Owen Hughes will challenge your preconceptions of everyone and everything over on Twitter or on the weekly podcast.